There are 222 species of owls, which are subdivided into two families; typical owls (Strigidae) and barn owls (Tytonidae). Horned owls and Eagle owls: Bubo; includes former genera Nyctea and Ketupa, some two dozen species. Please note: Eagle Owl may refer to any of various species of big owls, such as the Eurasian Eagle Owl. Mottled Owl, Ciccaba virgata : The Mottled Owl is a medium sized owl found from Mexico to Brazil and Argentina. The body has vertical bars on the chest and throat and white markings in the back. The eyes are dark and the head is round and they do not have ear tufts. It is thirteen to fifteen inches in length. They are territorial and found in dry forests and jungles up to 7500 feet above sea level. 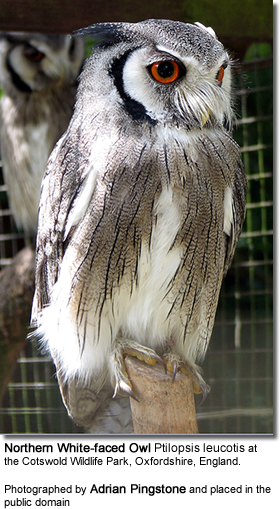 Mascarenotus: Mascarene owls, 3 species (extinct) : The Mascarene owls form a distinct genus (Mascarenotus) of owls. The three species are all extinct. Barn Owls aka Delicate Owl, Monkey-Faced Owl, White Owl (Tytonidae - Tyto alba) - also see "Hissing Owl"